My Marti report lists a dealer different than the invoice for my car. Is there a mistake? No, this is not a mistake. There are a few reasons why the dealer listed on an invoice is sometimes different than the dealer listed on the Marti report. The dealer listed on the Marti report is what is known as the "Selling Dealer." This is the dealership that actually sold the vehicle. The dealer listed on the invoice is known as the "Ordering Dealer." As the name implies, this is the dealer that ordered the vehicle. Sometimes, a dealer ordered a vehicle, then cancelled the order or refused delivery of the vehicle. In this case, Ford eventually sells the vehicle to a different dealer, who eventually sells the vehicle. A different, and more common, occurence happens when a dealer orders a vehicle, then sells the vehicle to a different dealer. 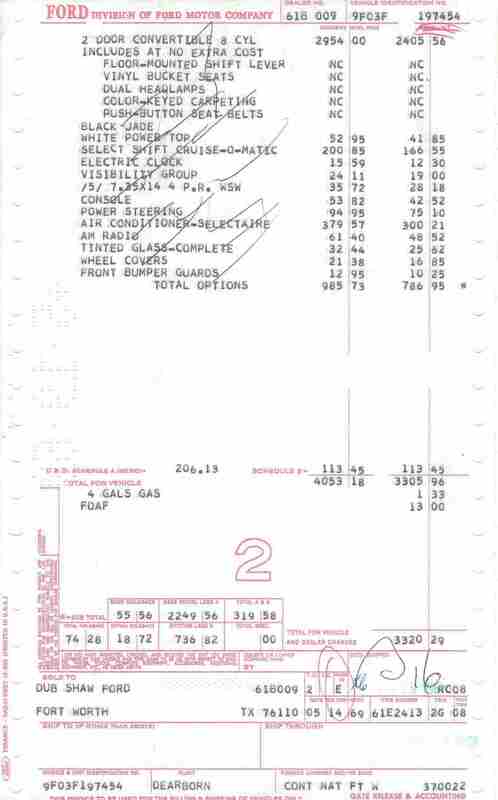 Looking at the invoice we have displayed here, Dub Shaw Ford ordered this vehicle as a stock order. At some point, Ken Moore Ford, a dealership about 45 miles from Dub Shaw, had a customer come in to buy a convertible. Dub Shaw did not happen to have a Mustang that met its customer requirements at the time. Ford had a system in place (it used Microfiche - this was before the Internet!) that showed dealer inventory available across the country. A salesman discovered that Dub Shaw Ford had a Mustang convertible that would satisfy its customer's request and requested a dealer transfer. The vehicle would be shipped over, with appropriate dealer-to-dealer paperwork, and Ken Moore Ford would be listed as the selling dealer in the Ford system. 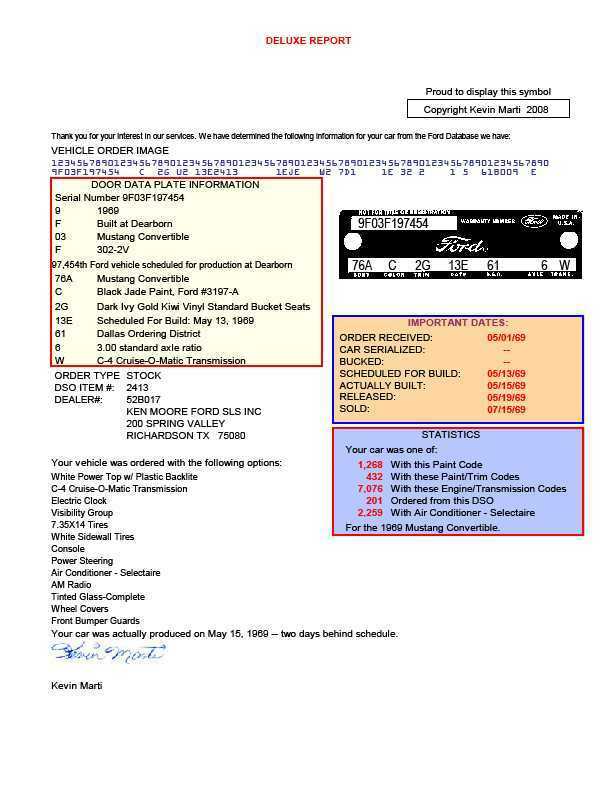 Note in the vehicle order image at the top of the Marti report. The Ordering Dealer is always listed in columns 70-75. The dealer code for Dub Shaw Ford is shown as 61B009, which matches the invoice. Another reason for a difference is what is known at Ford as a realignment. Periodically, dealers numbers are changed. During the transition, the old and new dealer numbers may appear on various paperwork at the same time.